Sure, that gel manicure looks fabulous the first day, but who wants to deal with the soaking and scraping when it's time to change your color? 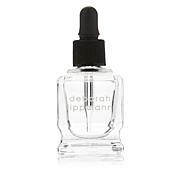 As an alternative, this base- and top-coat duo offers shine and long wear, but can be wiped away with any polish remover. Great-looking tips without all the hassle? Nailed it. Ingredients: Sd Alcohol 40-B . Butyl Acetate . Polyvinyl Butyral . Ethyl Acetate . Tosylamide/Epoxy Resin . Adipic Acid/Neopentyl Glycol/Trimellitic Anyhydride Copolymer . Trimethyl Pentanyl Diisobutyrate . Silica. Nitrocellulose . Isopropyl Alcohol . Glycidoxypropyl Trimethoxysilane . Methacryloyl Propyltrimethoxysilane . Methyltriethoxysilane . Mercaptopropyltrimethoxysilane . Benzophenone-1 . Dimethicone . Biotin . Water/Aqua/Eau . Camellia Oleifera Leaf Extract . Acoumea Klaineana Resin Extract . Ingredients: Ethyl Acetate . Isopropyl Alcohol . Butyl Acetate . Cellulose Acetate Butyrate . Acrylates Copolymer . Trimethyl Pentanyl Diisobutyrate . Triphenyl Phosphate . Benzophenone-1 . Diisopropanolamine/Methylhexahydrophthalic Anhydride Nonanoate Copolymer . Shellac . Dimethicone . Biotin . Water/Aqua/Eau . Camellia Oleifera Leaf Extract . Aucoumea Klaineana Resin Extract . Violet 2 (CI 60725) . Deborah has come out with a great product for the nails. I reccomend it. I have a lot a trouble growing my nails and these products have been very helpful. I have used these products for a long time. I have found them the very best for long wear and satisfaction in not having chipping or peelingI will continue use..
With using these 1st & top gel polishes allows my nails to shine, to last, along with easy removal when wanting a color change. GREAT PRODUCTS. I'd stock up more if they ever go on sale, as most others would too. Lastly, my nails grow stronger faster with Deborah Lippmann's products. I am always in yards playing in the dirt too. Love love love these 2 products! They make your polish glide on and stay on longer while protecting your nail, and the top coat is the BEST! Gives you the fullness of the gel manicure look while setting and protecting your polish. You are only doing 1/2 the job if you just slap some color on your nails and if you say they chip after a couple of days what do you expect? You are cutting corners and you get what you put into it - a half done result on a half done manicure! Use base and top coat!! I use this base and top coat with the gel lab pro colors. Great healthy formula that dries quickly and makes my nails look shiny.